Posted in Kathmandu, Move, Nepal	by Ms.Z. I have received so many messages from so many of you, my dear readers, over the course of the past two years, wondering if I am alright and what is happening with The Roofs of Kathmandu. Well, I am sorry. Sorry to have been keeping you in the dark. The last two years have been, hmmm, a whirlwind of events in my life, the greatest of which was little Mr. A who made an appearance in this world bringing us the greatest joy ever! Also, not leaving me any time for blogging, or pretty much anything else (how do you, parents, do this???). Another great change that happened is that we left Nepal. Yup, that chapter is now closed, for sometime at least. 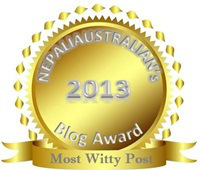 So, in some ways I suppose I felt there is no purpose of continuing blogging about Kathmandu when I am no longer there. That just made sense to me. However, as I am typing this, I am starting to get nostalgic, both about Kathmandu and blogging, so who knows, maybe I come back with some nostalgia-filled posts about Nepal. It is, without a doubt, a place that changed my life and me. This is it, for now.